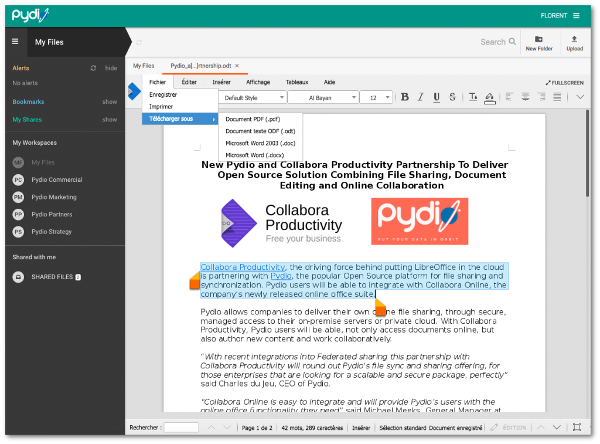 Today Collabora announced that Pydio 7, the latest release of the popular open source synchronisation & sharing platform, includes LibreOffice Online functionality created by Collabora Productivity. Collabora Productivity is the driving force behind putting LibreOffice in the cloud, providing a range of products and consulting to enterprise and government. It’s a leading contributor to the LibreOffice codebase and community. Its Collabora Office for Desktop and Collabora Online products provide a business-hardened office suite with long-term, multi-platform support. Pydio is the world’s largest open source file sharing and synchronisation project for business. The Pydio Project delivers a sustainable balance between the needs of business customers and the collaborative spirit of open source. Sold in 25 countries around the world, Pydio is used by leading brands such as Nikon. Collabora Online in Pydio is available for enterprise deployments and community edition home users. For more information about the release or an online demo, readers should contact sales [at] pydio.com or sales [at] collaboraoffice.com.